Hi There I’m Nigel From Carousel Projects and I’m going to talk today about writing the best meta title for your web page whether that be the home page or another page on your website. I’ve got good practice and bad practice. Optimising your title tag is one of the best ways of achieving a real boost for a webpage. With solid keyword research and optimal text in the tag at the right length you can really, yes really! lift a page in search engines! Google allows between 60 and 70 characters or 570 pixels, the reason there is a range there is clearly some letters are wider than others and so a W is wider than an I and so a W will take up more space. I’ve tested it up to around 588 pixels. Above that and Google will put an ellipsis at the end which is three dots, so you will see in the search results that there will be various titles with a three-dot ellipsis at the end, appended with the company name. It’s not ideal because that’s Google doing it for you, and you want to actually convey the meaning of the page in your own words. So keep in concise, keep it within 70 characters, and check. If it goes beyond it and you see the three dots then shorten it slightly. You may also want to put UK or something like that. It’s all driven by keyword research! 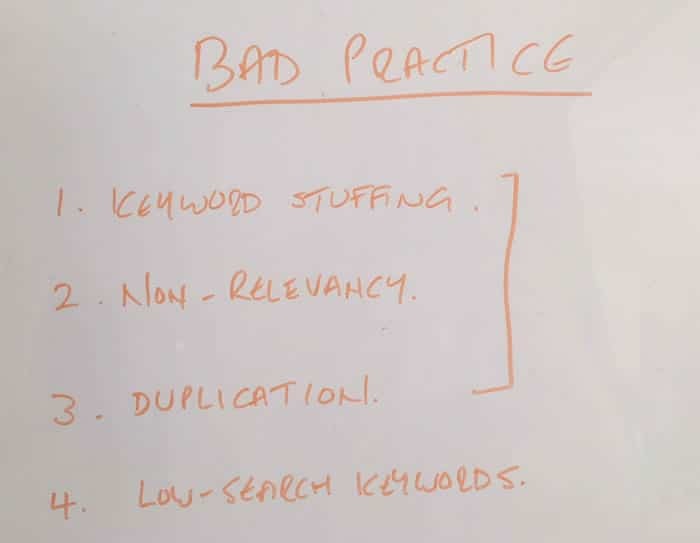 So you can make these up and bring them out of your head, and come up with what you think the primary keyword is, and the secondary keyword is, but you must do keyword research to find out actually what people search for. It’s very easy to come up with what you think the greatest keyword is, but actually, it might not be the case and you might. Be surprised that there are keywords in there that you haven’t even though of. We did some research recently and actually, it came up that brand name and UK was the primary keyword. We didn’t know that, we thought it was just the brand name. And so once we appended UK on tp the end of the brand name, say Clarks UK, we shot up in search for the brand plus UK. So always do Keyword research. Where are you going to do that research? First port of call is Google, so go into Google and type in, say, ‘Clarks Ruby Sandal‘ find out the alternatives that come up, and have a look at the primary keywords and the secondary keywords. It’s free, it’s simple to use, and you’ll get 10 suggestions. At the bottom of the search you will get semantic searches as well ‘Related Searches’ – have a look at those and come up with a killer primary keyword, secondary keyword. 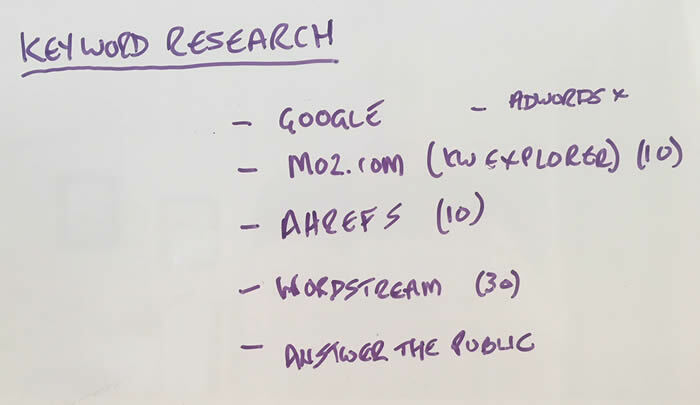 There are other places to go for keyword research, Moz.com has 10 free searches, AHrefs gives you 10 free searches, Wordstream 30. Als,o have a look at answerthepublic.com. There is a scary guy bouncing up and down with a beard, so have a look on answer the public, that’s a cool way of actually finding keywords related to questions. So ‘How much are Clarks Ruby sandals, or something like that. You’ll find those questions on that site. Take a look at Kwfinder.com – free searches and a very low-cost plan should you wish to keep using it! Always make sure that the title matches the theme of the page that it is on, so I’m assuming that your content is going to have 300+ words, there is nicely contextually written, semantically content and that the keywords in the title perfectly match the page. Perfect Meta Title – Stop Words? Number 6, don’t use stop words, try not to use stop words like ‘and’, ‘the’ ‘if’ and ‘but’ They are not searched for, it’s a waste of space, you only have 570 pixels and 70 characters so don’t waste them with stop words. Stick to what is relevant! Have a little bit more in that title so you can help people who are searching for the particular information. Something like that, will give something that people might actually search as opposed to just FAQs. 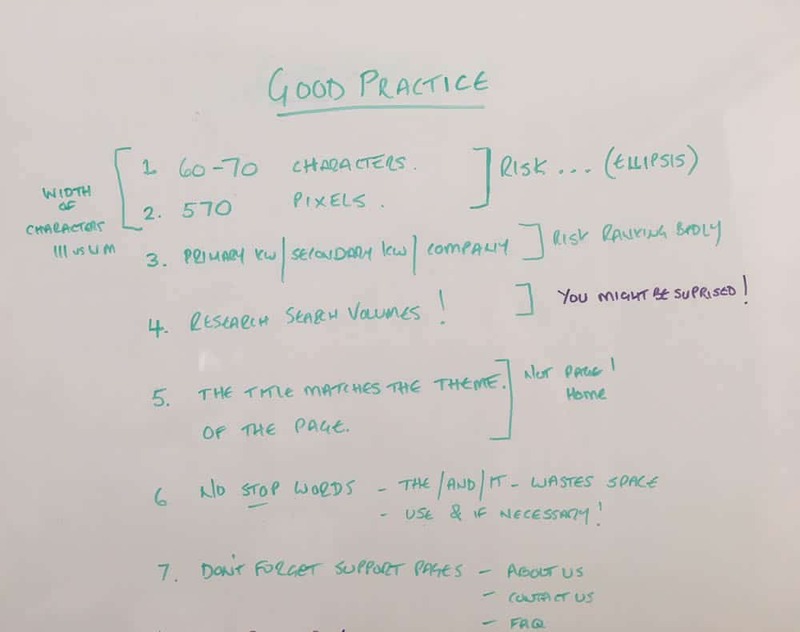 So, those are the basics, the good practice of what you should do, from the limits that Google impose, to the various places where you can go and do keyword research – for free, mostly. If you have a MOZ login, then you can do 5000 searches a month, it’s more than enough. Similar with AHrefs, SEMtush and Wordstream. Keyword Research is the most important thing you can do! And you put sandals, sandals, sandals an then sandals is mentioned all over the page as well then there are risks associated with that. Like I said before make sure that the title matches the page. If the title doesn’t match the page then the page is not going to convey the content that people are looking for. So the dwell time is going to be short, the bounce rate is going to be high, pogo-sticking, people going to the site and then jumping back to Google for a better result, that’s going to damage your page. It’sll damage the trust on the page so the page is going to dop because it’s not relevant to the search. Make sure every page on your website has a separate title. Don’t put the same keyword in the title on multiple pages. By all means, you are going to have for example Women’s Sandal’s on multiple pages but if the primary keyword is Clarks Ruby Sandal then don’t make a blog post that says Clarks Ruby Sandal because it’s going to compete with the main page. Keep things separate. One page – One theme! We’ve discussed keyword research in here, use the most relevant keywords, don’t go after something that’s a long-tail keyword unless you really want to get found for that. Keep it simple, keep it to the most searched for keywords. A low searched for keyword will result in a low ranking page. 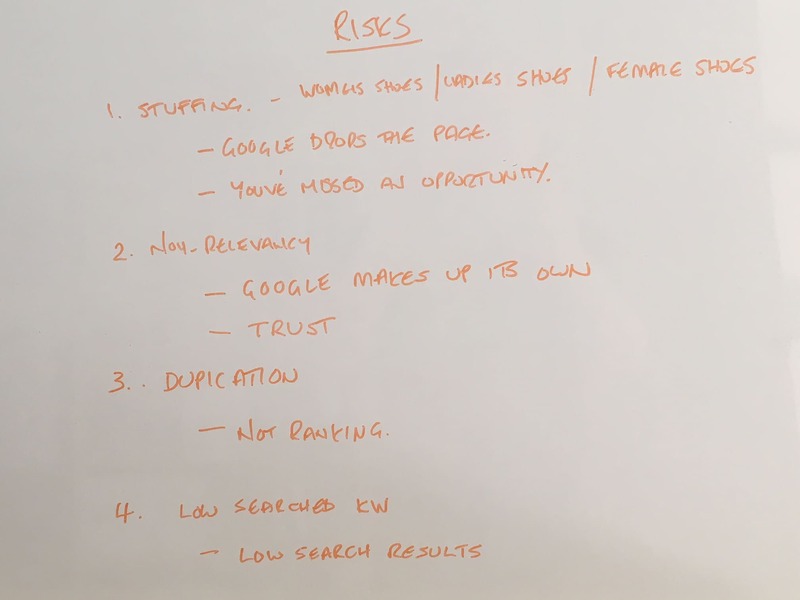 These are the risks for Keyword stuffing. Google will drop the page and you’ve missed an opportunity. To rank. Well, Google will make up its own! If it seems that the title is different from the page, not only are you going to upset people, but Google will make up it’s own Meta title, that may not be the one you want to convey, and also there is a lack of trust. It’ll just drop all of the pages and you are not going to rank for anything. 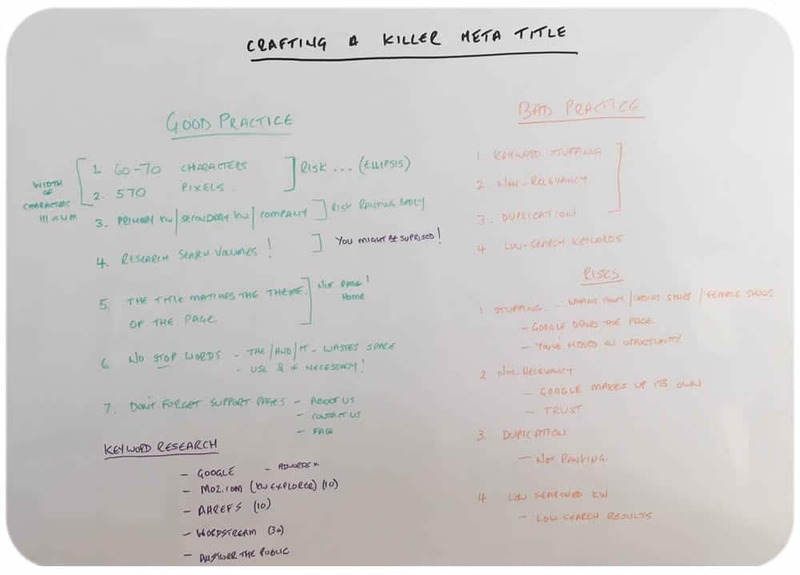 So there is a bit of an insight into how to optimise your meta titles. Go through your website, check all the pages, check the relevancy, use this format, and frankly, you can’t really go wrong with this. Because what you will find is that as soon as you start to implement this format and this research, you can improve the ranking of any page on your website. OK, you will have to back it up with H1 headings on the page, relevant content, but this information, the usage of this is golden and that will help craf a killer meta titlke for your website. Best of luck, thanks very much, and you will see me again when we will cover descriptions.